SAN FRANCISCOWhen Liz DeRouen needs any kind of health care services, from diabetes counseling to a dental cleaning, she checks into a government-funded clinic in Northern California's wine country that covers all her medical needs. Her care and the medical services for her children and grandchildren are paid for as part of the government's treaty obligations to American Indian tribes dating back nearly a century. But under President Barack Obama's health care overhaul, DeRouen and tens of thousands of others who identify as Native American will face a new reality. They will have to buy their own health insurance policies or pay a $695 fine from the Internal Revenue Service unless they can prove that they are "Indian enough" to claim one of the few exemptions allowed under the Affordable Care Act's mandate that all Americans carry insurance. "I'm no less Indian than I was yesterday, and just because the definition of who is Indian got changed in the law doesn't mean that it's fair for people to be penalized," said DeRouen, a former tribal administrator for the Dry Creek Rancheria Band of Pomo Indians who lost her membership amid a leadership dispute in 2009. "If I suddenly have to pay for my own health insurance to avoid the fine, I won't be able to afford it." The Affordable Care Act takes a narrow view of who is considered American Indian and can avoid the tax penalty, which will reach a minimum of $695 when fully phased in. It limits the definition to those who can document their membership in one of about 560 tribes recognized by the U.S. Bureau of Indian Affairs. Yet more than 100 tribes nationwide are recognized only by states and not the federal government. Many tribes do not allow their members to enroll before they are 18, meaning some school-age children whose parents are American Indian might not be considered "Indian" under the definition in the act. Other tribal governments have complicated blood-quantum requirements or rules that all members must live on the reservation, even though nearly two-thirds of American Indians and Alaska Natives now live in metropolitan areas, partly a legacy of federal relocation and adoption programs. The definition of Indian in the Affordable Care Act is roiling emotions on reservations and in native enclaves across the country, but U.S. Department of Health and Human Services spokeswoman Erin Shields said the agency is powerless to change it without an act of Congress. The problem is so new that the federal government is still seeking to establish how many people might be affected, although Indian health advocacy groups estimate it could be up to 480,000. In California alone, about 21,000 people who currently receive free health care through Indian clinics are not recognized as Native American by the federal government and would have to pay the penalty, according to the nonprofit California Rural Indian Health Board. "We have and will continue to encourage a robust dialogue with American Indian and Alaska Native communities about this matter, and welcome their input and ideas for solutions," Shields said in a statement to The Associated Press. "Under the law, it would require a legislative rather than regulatory change to address this matter. And as we consider approaches to the best possible solution, we are eager to work with Congress." The IRS is working with the definition but has not yet decided how the agency will verify who qualifies as Indian or assess the penalty on tax returns, agency spokesman Eric Smith said. The IRS and U.S. Treasury have scheduled a May 29 public hearing on their proposed rules establishing who qualifies for an exemption from the insurance coverage requirement. Republican Rep. Tom Cole, a member of the Chickasaw Nation in Oklahoma and one of just two federal legislators who are members of a federally recognized tribe, said he was aware of the concerns and would ensure that care for native people was not compromised as the health overhaul rolls out. He declined to comment about whether he would sponsor a bill to address the issue. "This could lead to some tribal citizens being required to purchase insurance or face penalties even though they are covered by IHS," he said in a statement to The Associated Press, referring to the federal Indian Health Service. "I am watching the situation closely to ensure that those individuals already benefiting from care through IHS continue to receive it." The 2010 Census found that nearly one-third of the 6.2 million people who self-identify as American Indian or Alaska Native lack health insurance and that 28 percent live in poverty. The Indian Health Service, a division of U.S. Health and Human Services, oversees a network of clinics that are required to serve all patients of Indian ancestry, even if they cannot document their federal tribal status. One of those is the clinic in Santa Rosa, north of San Francisco, where DeRouen, 49, has been seen since she was a little girl. Molin Malicay, who directs the Sonoma County Indian Health Project, estimates DeRouen is among roughly 2,000 of his patients who would face the penalty. "In the clinics in Central and Northern California, we see many of us Indians who are not considered Indians in the eyes of the federal government because the government itself terminated their tribes," Malicay said. "We're trying to get some of these people covered for care under Medicaid, but there is still so much confusion in the pamphlets and videos about who is Indian (that) it makes it hard to give advice." Several members of the main tribal advisory group to the Centers for Medicare and Medicaid Services said in a recent conference call with the agency that the definition contained in the Affordable Care Act raises concerns that the U.S. could renege on its obligation to provide all people of Indian ancestry with free health care. Budget cuts already are set to reduce basic federal health programs for Indians by up to 8 percent. Some tribal elders who favor tighter restrictions on who gets to identify as Native American see it another way. Mychal Eaglefeathers, a 34-year-old member of the Northern Cheyenne Nation in southeastern Montana, said several elders he spoke with believe that allowing only members of federally recognized tribes to avoid the individual insurance mandate was a positive step, especially as the already strapped Indian Health Service clinics are forced to slash services. "Especially the elders I've talked to say as long as you're recognized, fine. But if you're not federally recognized, people shouldn't get nothing," he said. 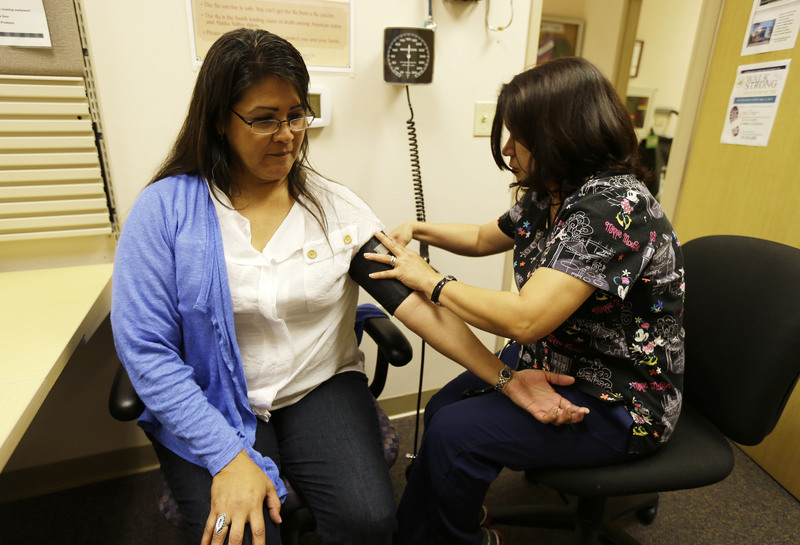 Valerie Davidson, a senior director at the Anchorage-based Alaska Native Tribal Health Consortium, estimates that about one-third of the 140,000 Alaska Native population would have to pay the health care penalty. That includes her nieces and nephews from the largely Yup'ik Eskimo region, comprised of tiny villages only accessible by plane or boat. She raises the possibility that native people would have to get extra documentation to prove they qualify. People have historically been able to use their federal tribal blood-quantum cards to get IHS health services, but that alone is no longer enough to qualify for the tax exemption under the Affordable Care Act, she said. In addition, many Alaska Natives who were born after December 1971 are prohibited from enrolling in their families' tribal corporations, even if all four grandparents are Alaska Native, she added. "Are America's first people really being forced yet again to prove our Indian-ness?" she said through tears on a recent conference call with federal agencies. "Every single day in our own communities we have to fight to demonstrate that we are still here, that we do still exist. We should be believed that what your parents and grandparents say you are, you are."